Details: On Monday, August 6, 2018, at 3:54 AM, Corcoran officers were dispatched to the 1700 block of Dairy Avenue for a subject who was stabbed. The male victim was flown to Kaweah Delta Hospital for a stab wound to his chest, which had pierced his lung. Corcoran Investigators searched the victim’s residence and among the items seized were kitchen knives and clothing. Through investigation it was determined the victims' girlfriend, Drew Thomas, was responsible for the stabbing. 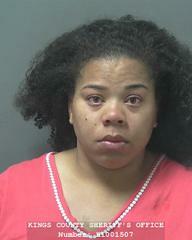 Investigators obtained an arrest warrant for Thomas and she was taken into custody on October 15th in the 1700 block of Dairy Ave. Thomas was booked into the Corcoran City Jail for the charges of attempted murder and assault with a deadly weapon. She was later transported to the Kings County Jail where she is being held on the $525,000.00 arrest warrant.